I was in a charms shop a while back and they had a section laid out for Celtic Mythology charms and their meanings. I had a look and found Thor's hammer. I ask my mom and she said the Mythologies are connected. I ignore this with my small mind, thinking, "How?" Then I get some money and took the family to Barns and Nobles. 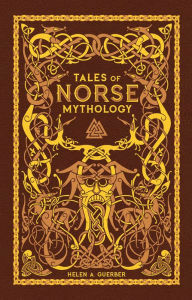 There I found a Norse Mythology book by Helen A. Guerber (I have yet to read it, but will when I get back from Basic Combat Training and AIT). I look at the cover and ask mom who it is. She looked and suggested the Green Man from Celtic Mythology. So I now ask, how are the two Mythologies connected/related/compared? How are Norse and Celtic mythology related? In a few different ways, I suppose. Because they are the mythologies of similar human societies. An example: the “Green Man” isn’t exclusively Celtic, faces made from or surrounded by leaves, fruits, vines or branches, or men with green skin, are found in ancient cultures throughout the world. Often they are related to dieties of rebirth and regeneration, responsible for the return of spring. In a society in the climate of north-western Europe during the first millennium, with rather “primitive” agriculture, without supermarkets and without refrigerators, people were much more dependent on the rebirth of nature in spring for their food supplies. A long winter could literally cost lives, so it is no wonder the return of spring was seen as a godly gift. With the earth turning green again, and plants getting leaves out of nowhere, it doesn’t seem such an illogical step to represent the god responsible for this as a green man surrounded by leaves. Joseph Campbell, autor of a popular book with the title The Hero with a Thousand Faces, even goes as far as proposing a basic structure for myths in general, based upon a Jungian conception of archetypes. Because the roots of Norse mythology supposedly lay in a Common Germanic mythology, which in turn goes back to a common (Western) Indo-European mythology from which also Celtic mythology is thought to originate. An example: The celtic god Taranis’ name (meaning “thunderer”) is likely connected to Norse Thor (and Anglo-Saxon Thunor, German Donar, all from Common Germanic Thunraz meaning “thunderer”). Even the name of the Hittite god Tarhun might reflect the same root. But there is more: in Norse mythology, the mother of Thor is Fjörgynn. Her name is etymologically equivalent to the names of thunder gods in a lot of other Indo-European cultures, and even of other cultures influenced by the Indo-European: Slavic Perun, Lithuanian Perkunas, Sanskrit Parjanya, Albanian Perëndi, Thracian Perkon… The name is associated with the oak-tree. Maximus Tyrius in his 38th dissertation states that the Celts, too, venerate their Jupiter (i.e. their god of thunder) not with statues but by worshipping oaks instead. Germanic pagans are said to have worshipped Donar’s oak, according to Wilibald in his Life of Saint Boniface. Also the Greek God of thunder, Zeus, was worshipped in an oak tree at the ancient oracle of Dodona. Etc. etc. Because they are mythologies that were in contact with each other during a considerable period of time, which favours mutual cultural influences. As a matter of fact, Germanic and Celtic cultures have been in close contact during a long time. When the Norwegians started settling the Faroe islands and Iceland, they encountered Gaelic monks who were already living there. Lots of vikings also settled on the British isles and assimilated into society, but not without leaving traces in the culture. For example, Viking ships and weapons became models for later Irish ship and weapon designs. Not the answer you're looking for? Browse other questions tagged norse comparative celtic or ask your own question.